Despite being widely accepted as a giallo it is probably not fair to describe Illustrious Corpses as such. While it does in fact have a strong whodunnit element the film lacks the populist flourishes or pulp inspired stylistic and thematic elements associated with the genre. Instead the film is an intense political thriller that is rich in intrigue. Blessed with incredible cinematography courtesy of Death in Venice's Pasqualino De Santis the film is a visual delight from start to finish. Fans of works such as A Very British Coup, Z or I as in Icarus will really get off on this one. 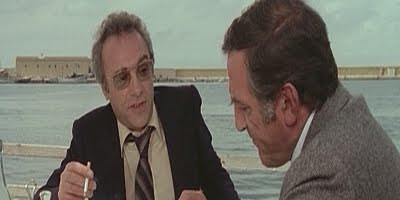 Given that this Francesco Rosi film was made a number of years before the murder of Aldo Moro it seems, with hindsight, to be almost prophetic. As such, the film represents an incredibly perceptive view of Italian politics of the time. The ending is both brilliant and jaw dropping. Fernando Rey, Max von Sydow and Marcel Bozzuffi add an extremely strong international contingent to the proceedings.